Mince pies are enjoyed by many over the festive periods in regular or miniature size, but when thinking about Christmas recipes to develop, I realised I’d never seen a giant pie and this had to change. What could be more perfect as a Christmas dessert than a crumbly pastry crust, filled to the brim with heavily spiced, sticky dried fruit? I’ve swapped the traditional pastry topping for a buttery crumble, and combined the rich mincemeat filling with some grated apple for a touch of freshness. This dessert makes a great alternative to the classic Christmas pudding, and you can make the whole thing in advance and freeze it, so it is ready to be baked from frozen on the day. Serve in large slices, doused in homemade brandy custard, for a dessert to remember. This recipe was originally written for Waitrose and published in the Waitrose Weekend paper. 1. Place the flour, almonds, cinnamon and icing sugar into a large bowl and mix until well combined. Add the butter and rub into the flour until the mixture looks like fine breadcrumbs. Add the egg yolk and 1-2 tbsp of cold water and mix with a round ended knife. When the mixture starts to clump, tip the bowl out onto a large piece of clingfilm and knead briefly until the pastry makes a ball. Wrap in clingfilm and put in the fridge for 30 minutes. 2. Preheat the oven to 200°C, gas mark 6. Roll the pastry out on a lightly floured surface, to around 0.5cm thick or large enough to cover the base and sides of a 24cm fluted, loose bottomed tart tin. Press the pastry right into the tin edges, then roll the pin over the top to cut away any excess. Prick the base with a fork, then chill for 15 minutes. 3. Line the pastry with parchment and fill with baking beans and bake for 15 minutes. Take out the beans and bake for 8-10 minutes, then remove from the oven. Reduce the heat to 180°C, gas mark 4. 4. Mix the apple and mincemeat in a bowl and spread into the case. Mix the crumble ingredients and rub in the butter until it all clumps then sprinkle over the mincemeat. Use leftover pastry to decorate. 5. Brush the pastry on top with beaten egg and bake for 25-30 minutes or until golden and the filling is bubbling. Serve hot or cold with lots of my vanilla brandy custard! Cook’s tip: You can freeze the pie uncooked for 3 months, at the end of step 4. Bake from frozen, covered with foil, for 30 minutes then remove the foil and bake for 15-20 minutes. 24 days to go! Welcome to day 1 of my Crave Christmas Countdown! Christmas is all about indulging in the richest of foods. 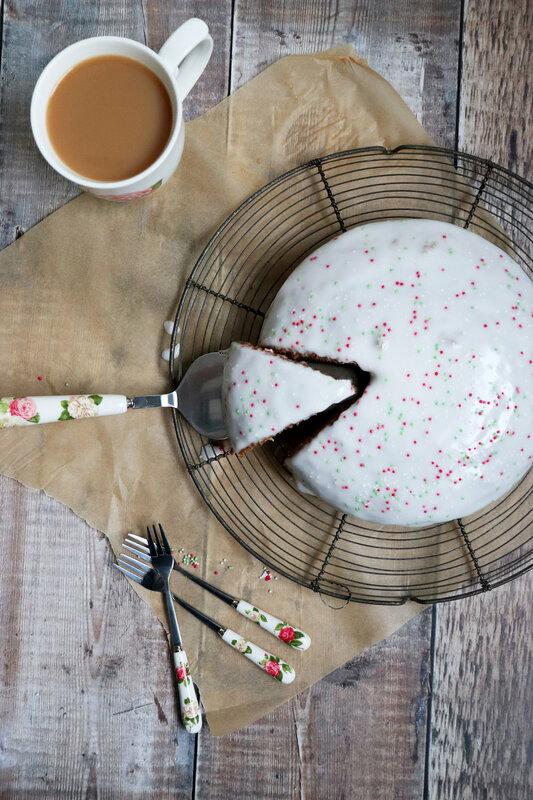 Christmas Cake usually takes centre stage, meaning it should be the richest of the lot. Far too often I’ve begrudgingly consumed dry, mildly flavoured fruitcakes, but Christmas is a time for more than just simplicity. 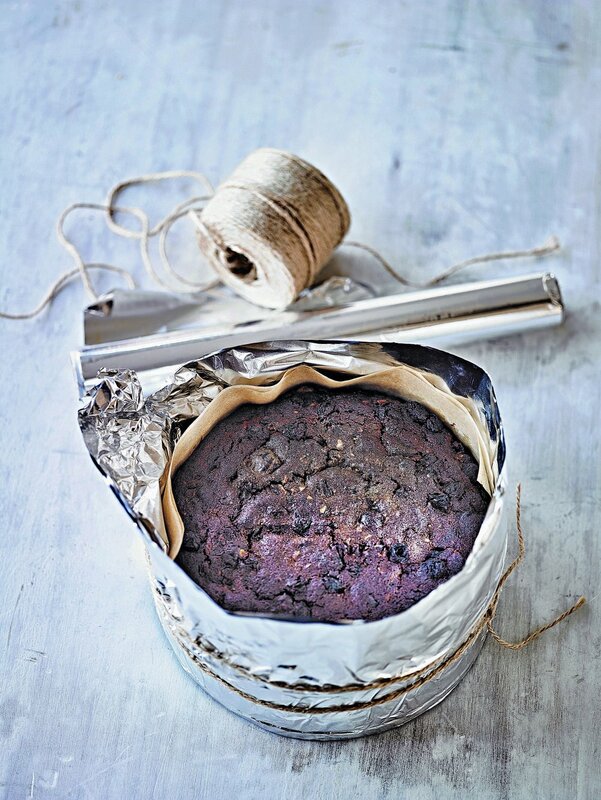 This is my dark, sticky Christmas cake recipe that is perfect for frosty days and long nights. The fruits are jammy and plump with a real depth of flavour, thanks to being soaked and heated in treacle and brandy. I use a mix of dates, prunes and cherries as well as classic raisins to ensure every mouthful is moist. My secret to avoiding the curse of the dry sponge is to remove the cake from the oven when it is still very slightly damp in the centre. It continues cooking even after being removed from the oven and will be perfectly done once it has cooled to room temperature. Decorating Christmas Cakes can become a real faff. Sometimes I love getting creative and making a fun, detailed design, but often I just want simplicity. This cake is decorated simply with a blanket of white royal icing, and the deeply warming sponge underneath is what does the talking. Find the recipe below or pick up a physical copy in Waitrose Weekend over the next few days! 1. The night before, place the dried fruits into a large pan with the treacle, brandy, mixed spice, orange juice and zest. Stir, then gently cook for 5-10 minutes, stirring all the time until the fruit has plumped and most of the liquid has been absorbed. Remove from the heat, cover and leave to soak overnight. 2. When you are ready to bake, preheat the oven to 150°C, gas mark 2. Grease and line a 20cm deep, round loose-bottomed cake tin with baking parchment. Wrap the outside of the tin in aluminium foil with the shiny side facing out (this will reflect heat away from the outside of the cake making sure the sides don’t burn) and secure with string. 3. Beat together the butter and sugar in your biggest mixing bowl until smooth, then stir in the eggs one at a time. Mix in the ground and chopped almonds, plain flour and baking powder. Pour in the soaked dried fruits, using a spatula to make sure any sticky juices don’t get left in the pan, then stir together until well mixed. 4. Spoon the mixture into the prepared tin and smooth the top with a spatula. Bake in the centre of the oven for 2¼-2½ hours. When the cake is ready, it will be risen and firm but still slightly damp in the centre. 5. Cool completely in the tin, then use a skewer to pierce small holes across the top. Feed with 1-2 tbsp of brandy, then remove from the tin and wrap in fresh baking parchment, then foil. The cake will now keep for 2-3 months in a cool dark place. Feed with brandy about once every fortnight. 1. To make the royal icing for your fruit cake, pour the egg whites into a bowl and whisk using a handheld electric whisk until they look frothy, then add the sieved icing sugar a tablespoon at a time. Whisk well after each addition until all the sugar has been used. Add the glycerine and lemon juice, then whisk for a few minutes more until the icing is thick and holds stiff peaks. 2. Heat the sieved apricot jam in a small pan. Place the Christmas cake face down onto a large chopping board. Brush all over with a thin layer of jam, then roll out the marzipan on a surface dusted with icing sugar so it is large enough to completely cover the cake. Drape the rolled marzipan over the top of the cake and use your hands to press it to the shape of the outside. Trim off any excess and don’t worry if it’s not perfect as it will be covered by icing. 3. Spoon the royal icing onto the top of the marzipan-covered cake and use a palette knife to spread it over the whole surface, swirling it to create a choppy appearance. Sprinkle with a few edible gold or silver stars or a dusting of lustre spray, if liked, and leave to harden completely (around 2-3 days) before enjoying. The iced cake will keep for up to 2 weeks. This is a recipe I designed and developed for Waitrose Weekend. Decorating ordinary bakes to embody Christmas is one of my favourite hobbies. A simple spiced macaron is transformed into a Christmas Pudding with just a puddle of icing and a bit of care - friends and family will love these! Sticky, gooey, nutty mince pies. Click on the image to be directed to the recipe!